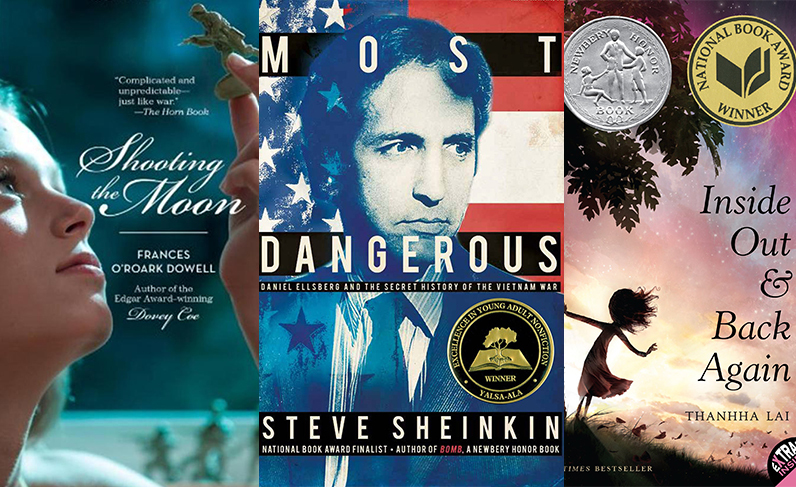 Love reading books about the people and stories in American history? Want to discuss them with other history lovers and take a close look at real museum artifacts and historic images? Join the History Center’s new Reading into History Family Book Club. Over the summer, youth ages 9 – 12 and their adults can join literary adventures that explore the Vietnam War era, connected with The Vietnam War: 1945 – 1975 exhibition. Each month, families will read either a historic fiction or nonfiction book at home. On the second Sundays of June, July, and August, we will host a book club wrap-up event at the History from 2 – 3:30 p.m.
During each of the Reading into History Family Book Club wrap-up events, we will have a discussion of the book of the month facilitated by a local librarian, an exploration of artifacts and archival materials related to the book, a family friendly mini-tour of the exhibit, and a snack. $20 for non-members and $15 for members, which includes one copy of the book, program fee, and museum admission for up to 2 youth ages 9-12 and 2 adults. Please register above. One copy of each month’s book is included with registration. Additional copies of the books are available for sale in the museum shop. You can also check out a copy of each book at your local library.